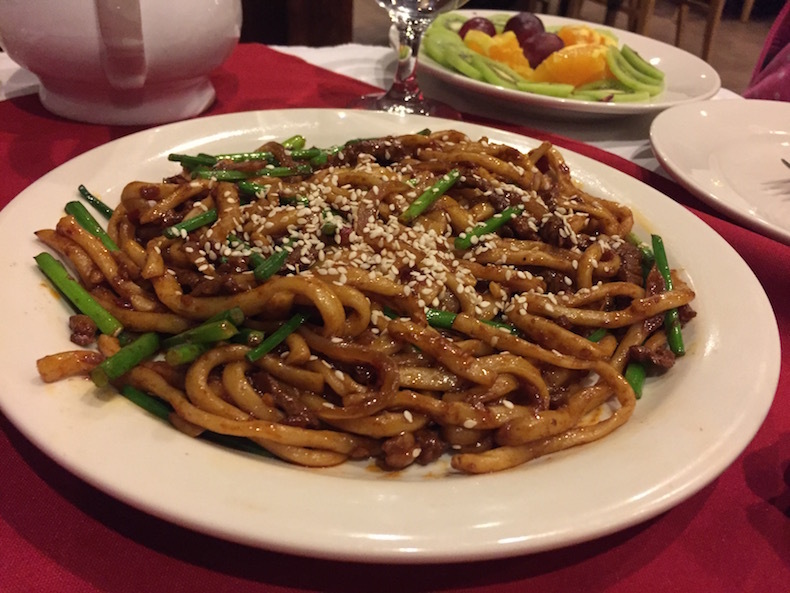 Head to Crystal City for a taste of this lesser-known cuisine hailing from Western China. When we think of Chinese dumplings or other ubiquitous mainstays in American take-out culture, pork features prominently. That is, unless the cook behind it hails from a Chinese Muslim minority group—one with roots along the Silk Road that long ago replaced pork with a dizzying confluence of other flavors. As of this year, Uyghur (pronounced WEE-gur) cuisine from this region is available at three restaurants in the Washington, D.C., area, making it seem far less rare than it actually is across the country (although it’s supposedly plentiful in Pasadena, Calif., where there is a concentration of expats). Queen Amannisa in Crystal City was the first to open here. Recently it was joined by Kiroran in Fairfax and Dolan Uyghur in Washington’s Cleveland Park. The cuisine will appeal to adventurous eaters looking for The Next Big Thing. But its basic elements, gleaned from several cultures that surround the Muslim enclave in Western China, are familiar enough to be comforting. Wendy Stuart, co-founder of a food-focused consultancy in Washington, first tasted Uyghur food in the Chinese city of Xi’an. Chinese women wearing the hijab caught her attention, but it was the food that left a lasting memory. She ate it again in Pasadena and then found out there was a restaurant here. 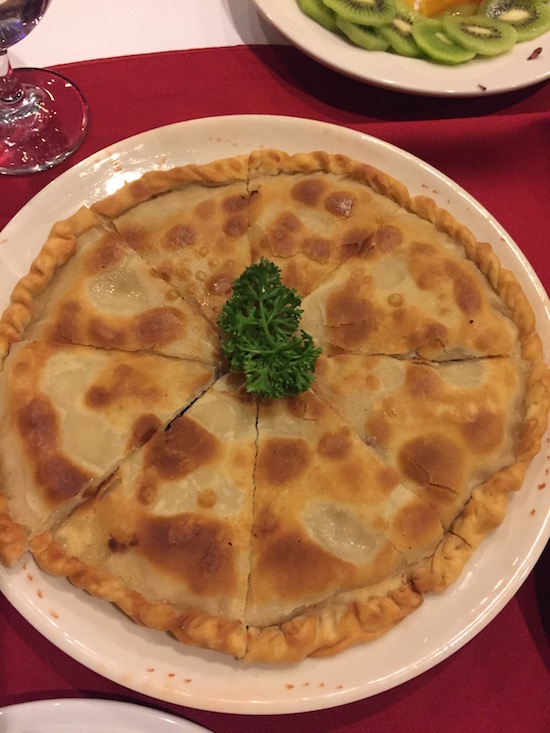 “It was so interesting to have halal Chinese food with this combination of ingredients from not only other regions of China, but also from the Ottomans, the Persians, the Mongolians,” she says. Queen Amannisa’s menu isn’t overwhelmingly lengthy but, because of the cuisine’s many regional influences, it can be a bit disorienting. For example, the long-grained lamb-and-rice polow is like any pilaf, with raisins, pomegranates and grated carrots, but might be mistaken for an Indian biryani or an Afghani kabuli more quickly than a Chinese dish. We start our meal at Queen Amannisa with mint tea and a meat naan that stuffs lamb and onion between sheets of thin pastry dough, not unlike a cheese-free calzone. It is mild in flavor compared with the spice to come, but filling. We order a cold salad of marinated cucumbers to balance the otherwise meaty (and a few fiery) options. What arrives at the table next looks like predictable Chinese food—noodle dishes strewn with strips of beef, red bell peppers and green onions—but the dry-fried laghman carries an essence of the Middle East. Many dishes such as this one contain dry spices such as cumin alongside fresh peppers for a heat and flavor that is unexpected. 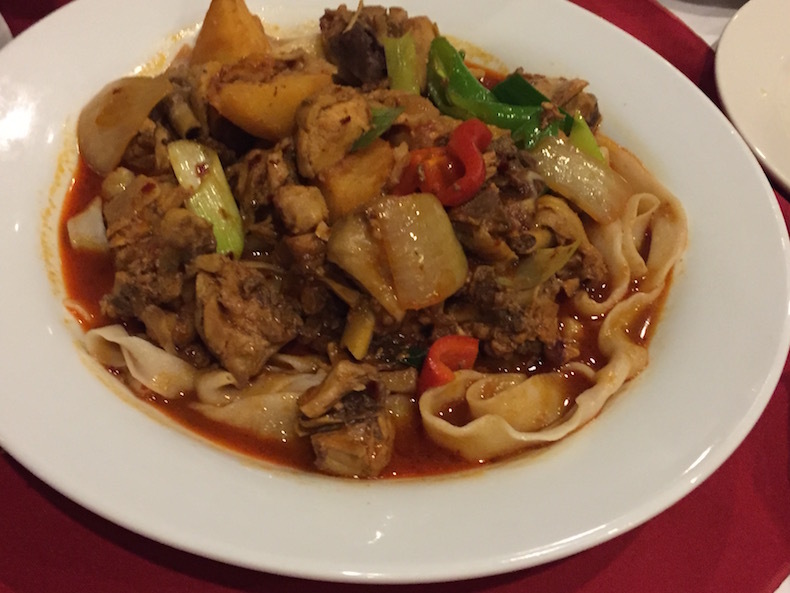 Each of the five laghman dishes on the menu features a different variation of the signature Uyghur noodle: some thick, some thin. Stuart tells me the noodles are typically made from little more than flour, water and salt, but they become delightfully chewy from the cook’s careful stretching of the dough, sometimes into one long noodle per dish. The Big Plate Chicken on the menu is, just as it sounds, a massive serving of chicken and noodles. But any similarities to the sick-day remedy end there as the dish draws on influences from China’s Szechuan province. The tiny pepper icon that appears next to it on the menu does not do justice to the amount of heat it contains, although the chicken’s flavor somehow manages to not be overwhelmed. Giant dumplings called “thin-skinned manta with meat” arrive at the table next, and I hardly notice that they’re filled with ground lamb instead of the expected pork. Either my tongue is too numb from the peppers, or Stuart’s prediction was right: with all that Uyghur has to offer, you don’t focus on what’s missing.